One of the most immediate casualties of substance use disorder is the romantic relationship. Issues of trust, codependency, fear, loyalty, guilt, and more very quickly erode the fabric of a romantic union and can have a significant psychological impact on each party when things go south. This risk is significantly compounded when both parties struggle with drugs or alcohol. Rehab for couples is a treatment resource for couples whose relationship has been threatened by the disease of addiction. More and more treatment facilities are offering this program as a means of preserving patients’ relationships so they have a viable support system during and after their treatment. What Does Substance Abuse Do to Relationships? The American Society of Addiction Medicine reports that substance abuse is present in approximately 40 to 60 percent of intimate-partner violence incidents. In addition to the significant safety risks associated with being part of a relationship affected by substance use, romantic counterparts of drug or alcohol abusers routinely experience deception and other toxic factors. It’s important to realize that drug and alcohol abuse creates serious changes in the brain’s chemistry. This translates to users engaging in bizarre, dishonest, and downright dangerous behavior in pursuit of their next fix. This behavior commonly spills over into users’ romantic relationships and renders their partners vulnerable to the consequences of their substance use. These issues are among the most common of those discussed in drug and alcohol rehab programs for couples. What Happens in Rehab for Couples? Rehab for couples can be administered in a variety of different paradigms. Though the most common type of couples’ rehab addresses relationships in which one person is abusing drugs or alcohol, it’s also common for couples in which both parties have fallen victim to substance use disorder to seek help. 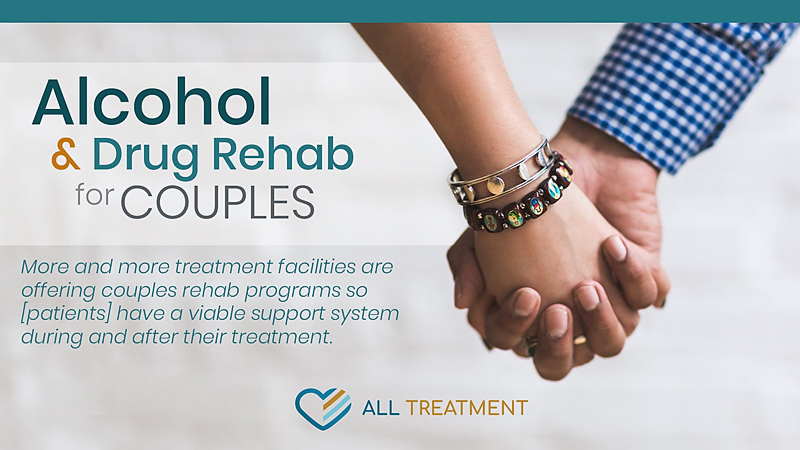 Rehab for couples incorporates counseling, family therapy, and a variety of collaborative modalities that explore the way substance abuse has impacted a relationship. This could include anything from boundary issues to codependency to enabling to issues of personal safety and more. The goal of the therapy is to help participating couples work through the issues that have affected them and develop a realistic framework for improvement and stability going forward. This process often involves working toward redeveloping trust and establishing accountability mechanisms for continued sobriety. However strained your relationships might seem in the face of your substance use disorder, it’s critical that you do everything you can to try and put things back together. From a personal and romantic perspective, drugs and alcohol are not worth losing the love of your life over. From a recovery perspective, strong relationships can be a critical and needed pillar of your support system. Turmoil in a recovering addict’s personal or romantic life can very quickly lead to relapse. Rehab for couples can provide a framework for healthy interaction between the two parties and create a bedrock for stability, accountability, and mutual respect.